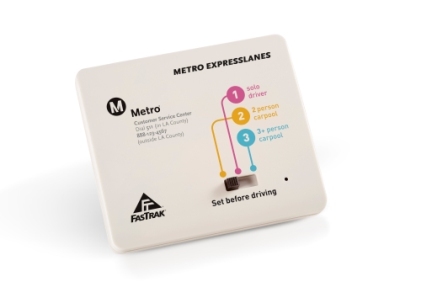 How do the FasTrak® transponders determine who’s traveling in the ExpressLanes? How do they do that? is a series for The Source that explores the technology that helps keep Metro running and passengers and other commuters moving. Some of it applies directly to the trains, buses and freeways, and some of it runs in the background — invisible to nearly everyone but essential to mobility in our region. Most of us know that changes are coming to the 110 Harbor Freeway. This Saturday — Nov. 10 — the HOV lanes will become High Occupancy Toll (HOT) lanes as part of a one-year demonstration project known as Metro ExpressLanes. The project will test whether ExpressLanes can help improve mobility in the traffic-choked 110 corridor. You may also know that Metro ExpressLanes will open early next year on the 10 San Bernardino Freeway. And that these changes will open the lanes to solo drivers who pay a toll. — how much toll to collect from each vehicle because the amounts charged will vary depending on traffic congestion? — what the real-time speed of traffic is in the ExpressLanes? — who to bill for travel in the ExpressLanes? — how to aid CHP with enforcement of the ExpressLanes? How can a small piece of equipment know so much? In part the answer is that the transponder does not do all of those things but is the first step in making most of them happen. Prior to about 1990 (and even now on older highways), tolls were collected by human attendants or electronic baskets at toll booths positioned along the highways. The toll booth system required that drivers come to a halt to hand over the toll. With modern ExpressLanes, like the one about to be tested inL.A.County, stopping is no longer necessary. There are no toll booths or attendants. Different cities have different systems. But for the year-long ExpressLanes demonstration, Los Angeles is using FasTrak®, which is the name of the electronic toll collection system. It includes a transponder that is mounted on the inside of a vehicle windshield. The transponder is a small battery-powered radio frequency identification unit that transmits radio signals. Stored in the transponder is basic account information, including an identification number. When the transponder passes under the overhead L-shaped antennas along the ExpressLanes, it communicates the account ID to the antennas. The antennas respond by messaging that information to a computer that calculates the toll rate for the individual commuter. Sensors measure congestion and transmit the speed of traffic flow in the ExpressLanes to a computer network. The computer network manages capacity in the lanes by using an algorithm to adjust the toll, based on traffic conditions. The tolls will range from 25 cents per mile to a maximum of $1.40 per mile. The more traffic in the ExpressLanes, the higher the toll assessed. The less traffic in the ExpressLanes, the lower the toll. However, the toll amount is locked in once the vehicle is in the ExpressLanes. If speeds fall below 45 mph for more than 10 minutes, the ExpressLanes signs alert solo drivers to not enter the ExpressLanes until speeds climb back to 45 mph or faster. However, solo drivers already with a trip in progress in the ExpressLanes will be allowed to complete their trip. This helps ensure smoother flowing traffic in the ExpressLanes for all who use them. If a sig-alert occurs and the toll payer is not able to travel at the minimum average speed of 45 mph, the customer’s FasTrak account will automatically be credited with the toll by the next business day. Net toll revenues will be reinvested into transit and other transportation improvements in the corridors where they are generated. While the principle behind most HOT lane transponders is similar, L.A. County’s ExpressLanes transponders are unique. They have been upgraded with the addition of a switch that can be changed to indicate 1, 2 or 3+ occupants in the vehicle. In this way, eligible carpools, vanpools and motorcycles can travel in the ExpressLanes toll free. The transponders can’t confirm the passenger count. But enhanced California Highway Patrol enforcement can and will. When the transponder is detected in the ExpressLanes, overhead enforcement beacon lights emit to correspond to the switch setting on the transponder. This light is visible to the CHP, which will use it as a guide for occupancy enforcement. If you have an existing FasTrak, it will work on the 110 and 10 ExpressLanes to pay a toll. But if you want to travel toll free on the 110 or 10, you will need to use a switchable FasTrak. You are not required to maintain more than one account. In fact, it’s recommended that only one FasTrak account is maintained based on the toll facilities that the customer uses most. If switching to Metro ExpressLanes, customers should contact their currently issuing agency for infomation about closing their FasTrak account prior to opening the account with Metro. Here’s more information about FasTrak, including how to sign up for an account and get a transponder. There are some technical details that are incorrect and misleading. This often happens when people try to simplify descriptions. 1. The antennas are not ‘L shaped’. The overhead supports fo the antennae maybe L shaped, but the antennae are rod or square shaped. There may also be other antennae used to send the data to the system instead of being hard-wired to the system. 2. The antennae don’t ‘message’ a computer. The information that the antennae receive is interpreted by a receiver and passed to some computer or network. 3. Most transponders do not respond with the account ID. The transponder responds with its own ID, which is associate in the system with the account ID. 4. The antennae do not track the transponder. The system tracks the transponder. The antennae are just the first point in receiving the data. The system analyzes it. Glad to see “How do they do that?” back in action. Hopefully we can get more of these. Who decided that position 1 = status 2, and position 2 = status 1? That’s a horrible design decision, complete with a confusing line diagram to match. Hope you’re not color blind.